Want your favorite meals with less fat? An air fryer may just be the miracle appliance you’ve been looking for! These machines use air-circulating technology to quickly fry your foods without the need for lots of oil. The result? Your food will be healthier without losing its taste. The OMorc air fryer tops our list with a perfect 10 rating! It’s easy to see why, too. It is incredibly easy to choose time, temperature, and preset options with the central control knob. Cleanup? Also pretty easy since the removable parts are dishwasher safe and the fry basket is nonstick. The health benefits to this device are really what make it stand apart from the crowd, though. Compared to traditional frying methods, this appliance lets you cook with up to 80% less fat. That, combined with the BPA-free design, means you can feel guilt-free using the OMorc air fryer to make all your favorites. A multifunctional device that cooks meals in a fraction of the time with a fraction of the oil? SharkNinja has you covered. 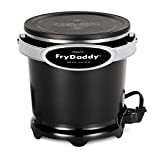 This Foodi is not just an air fryer, but also a steamer and pressure cooker. There’s not much you can’t do with one of these Ninjas! Cooking is also quick with the brand’s TenderCrisp Technology. The pressure cooker can take meats from frozen to cooked in just 20 minutes. If that wasn’t great enough, the nonstick design means cleanup is easy. 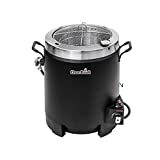 Like other air fryers, this device also significantly cuts down on fat. You can air fry French fries with up to 75% less fat compared to deep-fried varieties. SharkNinja is a top brand in home appliances for a reason. 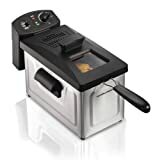 Air fryers don’t have to be expensive. This GoWISE USA fryer is affordable without sacrificing functionality. It’s easy to quickly prepare your favorite foods in a healthier manner with this appliance. There’s 8 preset cooking options, which means you simply need to select one option and let this machine do the rest. While this device is great at what it does, it is a little small at 3.7 quarts. Those who have larger families might want a larger unit. 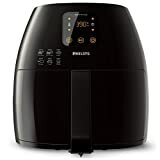 Individuals or smaller households can find a lot to love in this air fryer, though.